Vanessa Cahill blocks Casey Halle’s shot. (West Newbury) We’ve seen it before in the early rounds of the MIAA girls basketball tournament. A team from another conference gets to play Pentucket. They know that the Sachems press but don’t have the time to get fully prepared. Watertown (7-14) from the Middlesex League was Pentucket’s first round opponent this year and predictably found out the hard way what end-to-end defense looks like, losing, 52-22, on Monday night. 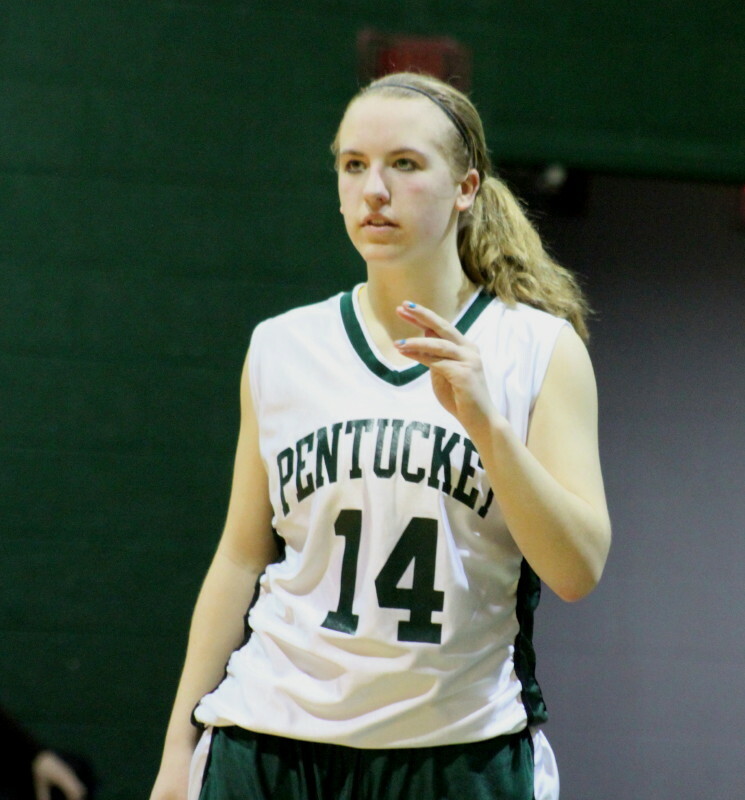 Pentucket will host Weston (14-7) on Thursday night at Pentucket in the quarter finals of Division 3 North play. The visiting Red Raiders struggled to get the ball up the court and only the dribbling skills of freshman Gabby Coppala minimized the backcourt turnovers. 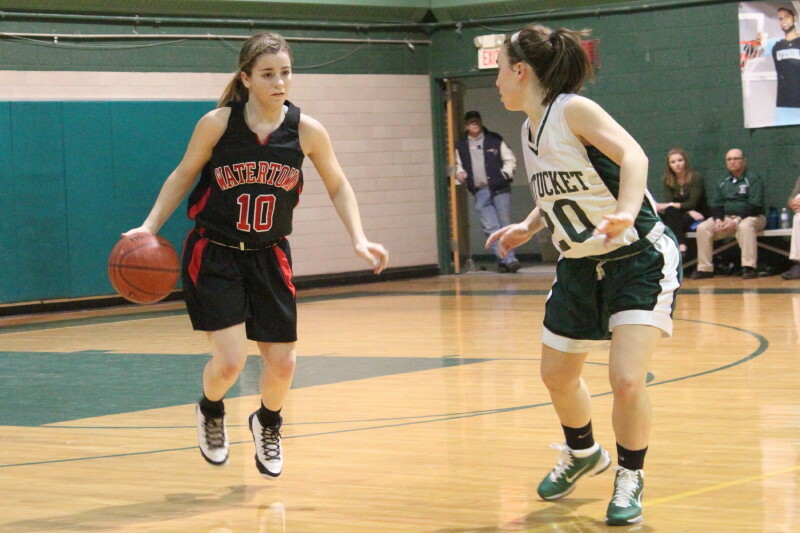 Sarah Higgins forces one of Watertown’s twenty-eight turnovers. 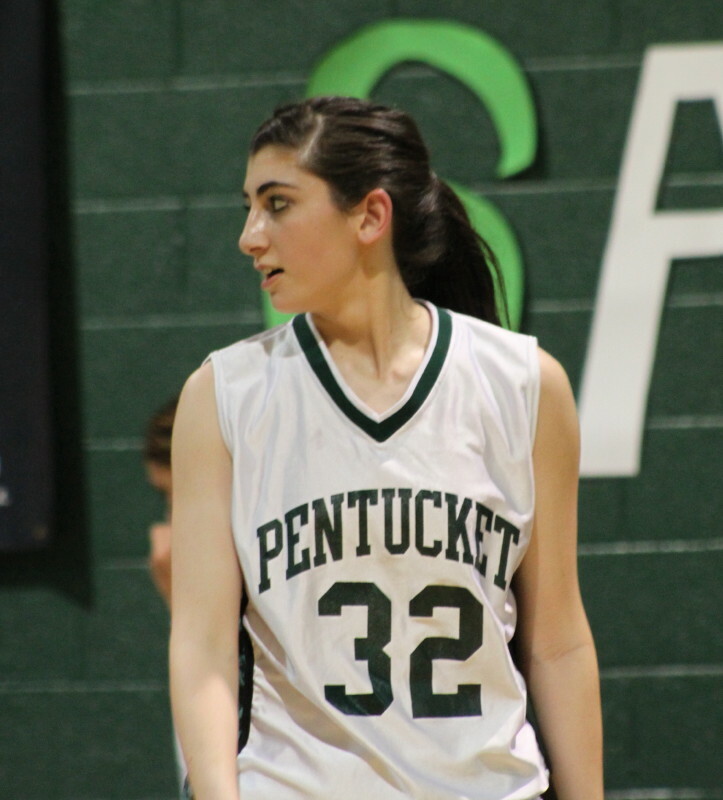 Even in the frontcourt, running an offense was difficult and Pentucket’s size discouraged layups and second chances. It took Watertown 3 ½ minutes to score (Gabby Coppala layup) their first basket and another four minutes to score their second (Casey Halle) layup. 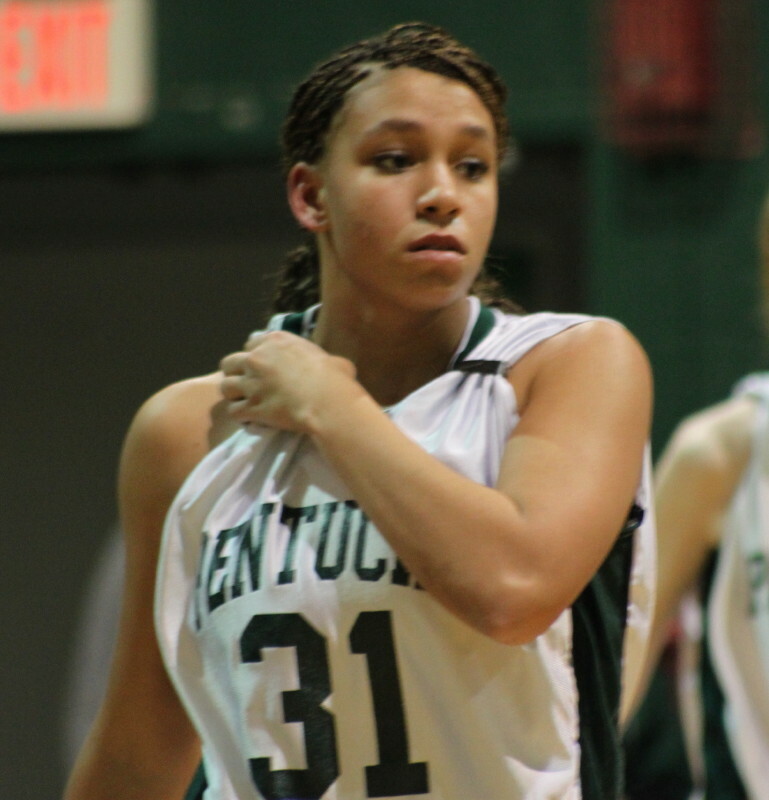 Meanwhile, Pentucket rang up twenty points. 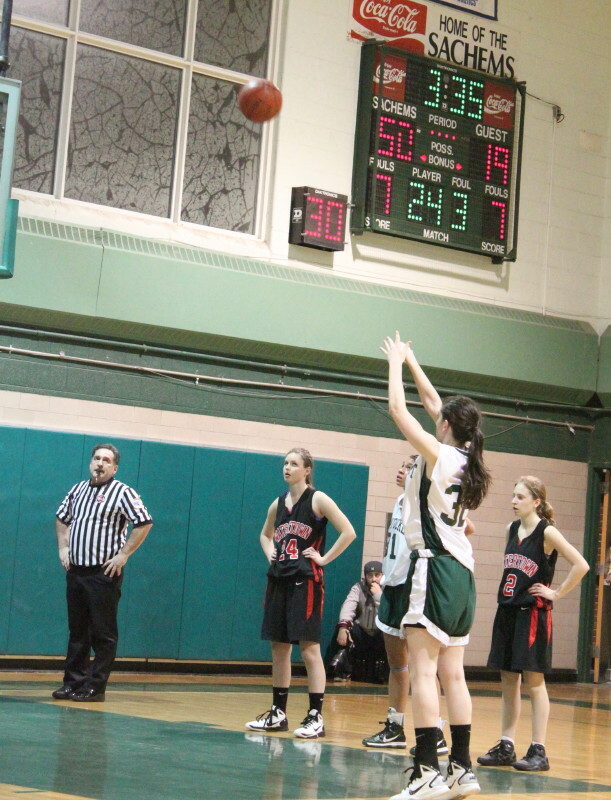 They made six-of-seven free throws and had two 3’s from Coley Viselli. Off to a 20-4 first quarter, Pentucket used the same formula (relentless defense) to put together a 15-4 second quarter. Besides shutting down Watertown, the Sachems dominated the boards and turned up free throws (thirteen) by going to the basket and rebounding missed shots. Sarah Higgins picked up seven points in the second quarter. Pentucket led, 35-8, at the half. This was a game begging for the Mercy Rule (softball) instead of a second half. I overheard one couple from Watertown discussing whether they should stay for the second half! 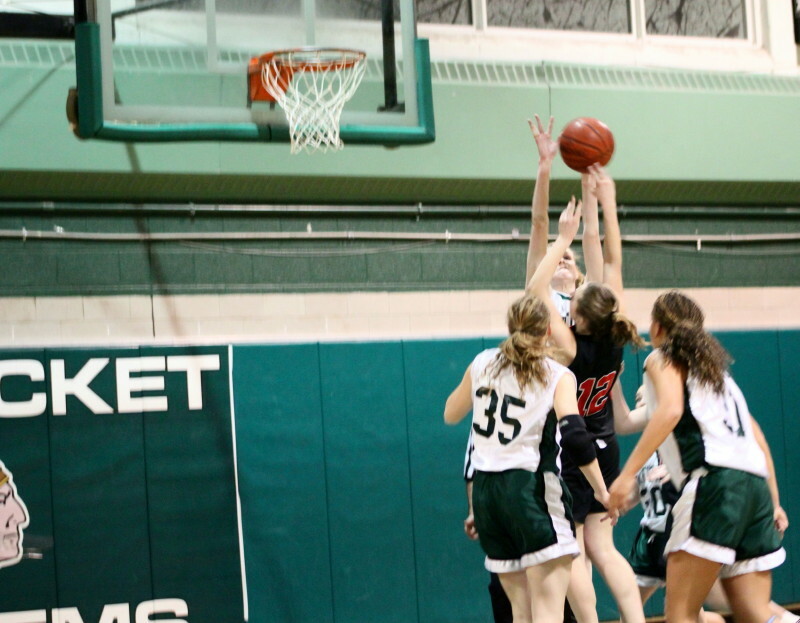 Freshmen Sydney Snow (#3) and Liza Brackbill (#22) see some late-game action for Pentucket. But they did play the second half and Pentucket played everyone. The scoring highlight from the second half was an eleven-point run by the Sachems during the first 4 ½ minutes of the final quarter. The scoring in this streak was provided by Alex Moore (layup), Coley Viselli (3-pointer), Sarah Higgins (layup & 2 free throws), and Tess Nogueira (2 free throws). Sarah, Tess, and Coley all finished with eleven points. 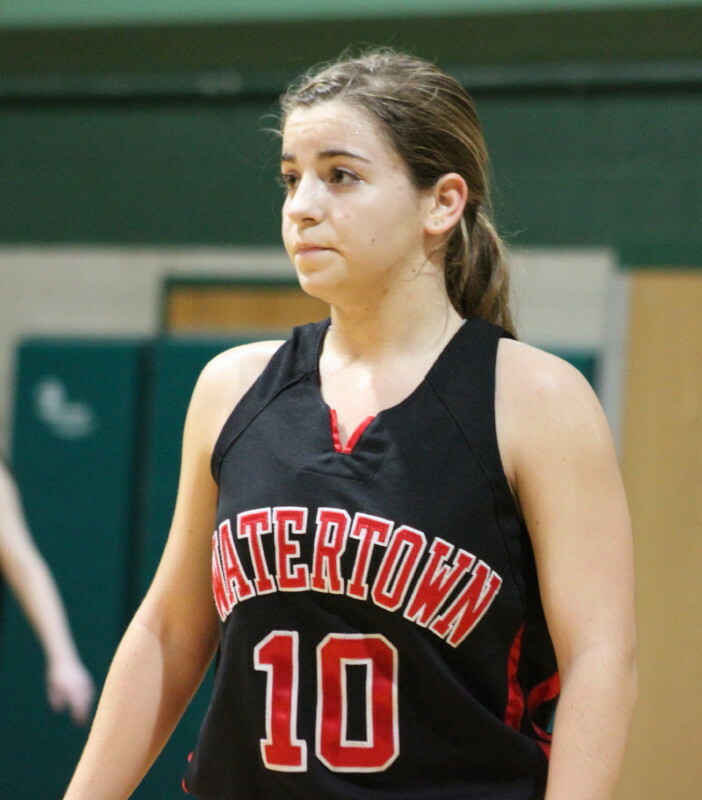 Freshman Gabby Coppala (11 points) of Watertown was impressive. The young guard was an excellent dribbler and passer in the midst of never-ending pressure. Pentucket double-teamed her and tried hard to keep the ball away from her. The statistics reveal the extent of the success of the Pentucket defense. They forced twenty-eight turnovers, including seventeen in the first half when this game was decided. The Raiders were 0-for-11 from long range and just 18% (9-for-50) overall from the floor. Plenty of positives to take away from this one regarding Pentucket’s defense. Their offense? The stats from this game tell me that they’re going to have to get a lot better with the ball if they are going to go very far in the tournament. Yes, they collected 52 points. And yes, they played everybody. But twenty-four turnovers! That’s a lot of empty possessions against an undersized team that didn‘t trap. 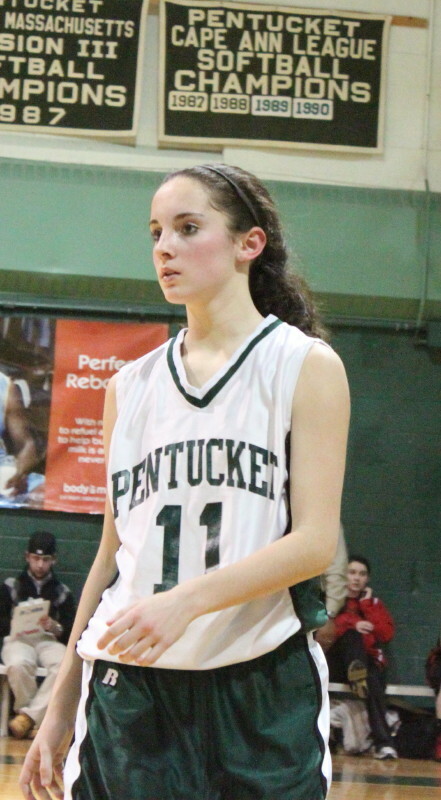 Pentucket shot 20% (3-for-15) from long range and 30% (15-for-50) overall from the floor. Plenty of high-percentage attempts didn’t fall. Free throw shooting was another problem area – 61.2% (19-for-31). Tess missed six including one that didn‘t hit anything. An area of strength was the offensive rebounding. Vanessa Cahill and Tess Nogueira were terrific in this area. Weston (14-7) is the next opponent and judging by their record I would expect a tougher game. However, if Pentucket keeps bringing that terrific defense and sharpens their ball management and shooting they’ll be fine, I suspect.